Things are real quiet on a Tuesday night in January in Fort Bragg California (situated about 3 hours north of the San Francisco bay area – or 4 and a half if you go up the coast on twisty route 1). The reason to be there is beer appreciation, of course – to appreciate one of the original craft beer “class of 1988” — North Coast Brewing. Out east we know them as the people who brought you “Old Rasputin Russian Imperial Stout” and then “Brother Thelonious” and the Belgian inspired “Pranqster”. Situated within sight of the Pacific, the brewery and it’s brew pub, swag store and offices dominate the north end of the small town. But, show up after 5 on a Tuesday and nothing is open, and while the brewery is humming with activity – no tours, no access – unless you happen to see a brewer or company worker coming in or out – then they are happy to talk to you a bit. Fortunately for me I got to talk to a brew guy – who along with some information about the Brewery’s 25th anniversary – suggested a gourmet pizza place with a great craft beer selection in town for dinner. Later I wedged my way into the compact “Piaci’s Pizza” and had an Old Rasputin – waiting for a place to sit at the bar. As I waited another astonished patron forced his way to the bar and asked me if this was the only pub in town. I said I didn’t think so – but that I was told this was the best. He was another beer appreciator making the pilgrimage for a glimpse at North Coast – but he had no patience and was gone. I enjoyed a “Bony Fingers” from Brian Hunt’s collection of extraordinary Moonlight beers, and eventually got my seat. 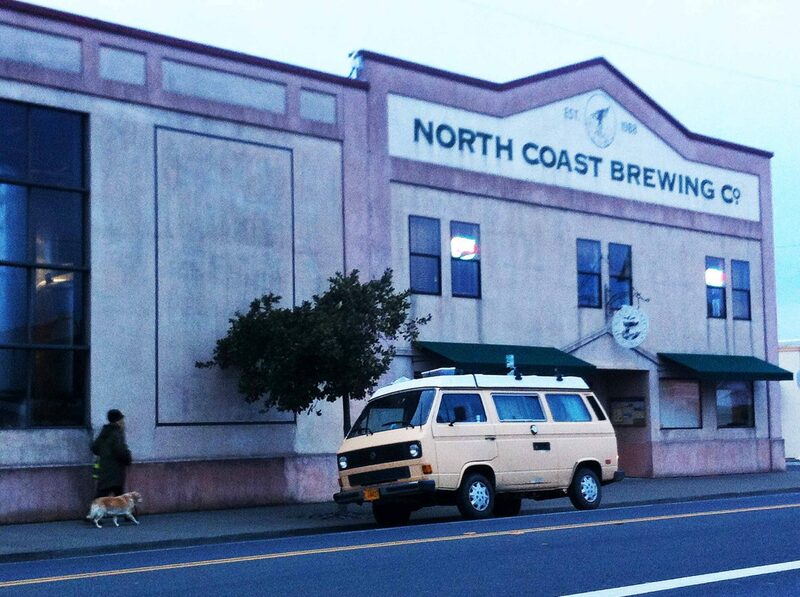 So, what’s going on at North Coast? Well, the 25th anniversary is a big deal – as they are joining “88 classmates” Deschutes and Rogue (both of Oregon – just a few hours north of Fort Bragg) to celebrate with a 10% ABV collaboration barley wine – actually three. Each brewery is creating a barley wine of their own – in recognition of the seminal book “Essentials of Beer Style” published by Fred Eckhardt also in 1988 – and then all three will then be brewed at each brewery. Other tidbits about North Coast include their dedication to supporting the local performing arts – donating over 100 thousand dollars – as well as nearly half a million dollars for Jazz education from the Brother Thelonious-supported foundation (Monk Institute) over the last 6 years. Nancy, their marketing rep proudly pointed out that their Saison “Le Merle” just won a Gold medal at the Brussels Beer Challenge.”We are brewing 4 days a week now, and in June we will be 24/7 – we can’t keep up with the demand”. Under zoning restrictions from Fort Bragg, they are continually renovating to create more space for brewing, but are not able to expand the same ways as many of the other west coast breweries are. 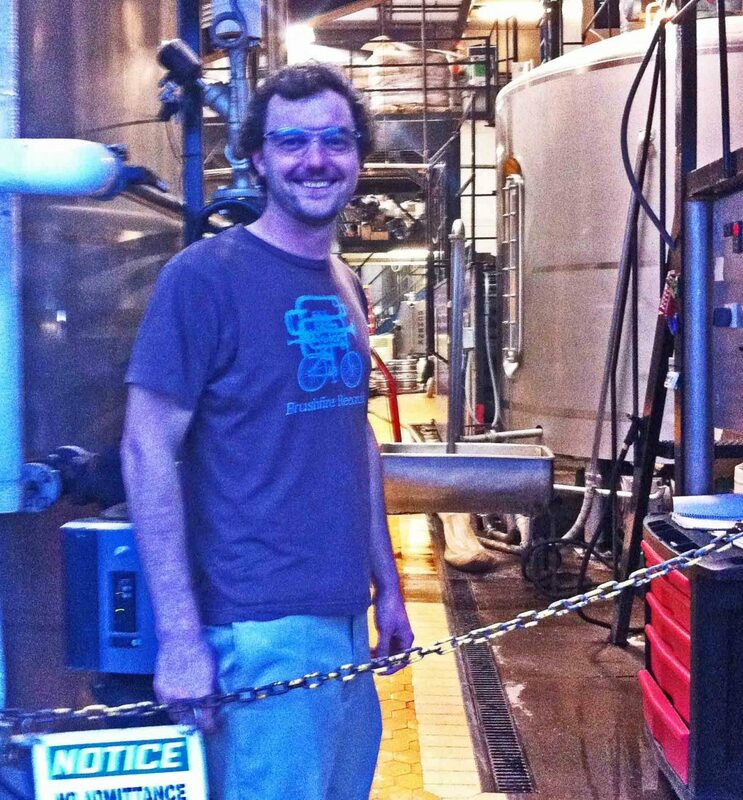 “We like it here, the spring water is really good – and the workers here are happy, the beer makes people happy. It’s all about dedication to quality”. If you want find Le Merle, or other fine beers from North Coast like their Scrimshaw Pilsner and Acme IPA – go on their website and use the “find our beers” to see where you can get them. I am sure you will appreciate the results of their happiness as I do. Happy Brew Guys at North Coast.. If you can find ’em!